2016-04-13 Well, my "final conclusion" is that this thing is a bust! I'm guessing the tiny spark is simply not adequate for real world use. Yes, it will ignite an alcohol stove. But seemingly only under ideal conditions. So for now at least, it's staying home. One needs dependable stuff in the field. I'll keep it in the back of my mind and may come up with some modifications that make it work but for now, a lighter or matches, or even a fire starter are far superior! DIY Alcohol Stove Igniter that's unaffected by wind and rain! And is cheap!! 2016-04-07 In playing with the Taco Soup de/re-hydrating I think I discovered how to use this igniter successfully under most circumstances. That is to hold the spark gap of the igniter very close (but not touching) the surface of the alcohol in the stove. It only took a couple clicks doing it that way to get ignition. Haven't tried it again outside in breezy conditions so I'm not positive this will ALWAYS work. Finished igniter tip with wire-glue teardrops to increase the spark size. The plastic sleeve can be slid down over the tips to protect them while carrying the igniter. 2016-03-31 I've been mulling over my lack of success with my pretty little igniter. It clearly shoots a spark. And when I first tested it out indoors it caused a flame with the first click with the spark gap anywhere near the alcohol. I knew the spark was "light" and also knew that with the pointy ends of the wires where the spark launched it was bound to be small. If I could just find a way to create kind of a ball instead of those wires.... My first thought was a solder glob. Being in electronics I know a solder glob is not considered good soldering technique, but it might get what I wanted here. But to my dismay, the wire they used on the igniter simply doesn't take solder! It was then I spotted the little container of "wire glue" that a friend had given me some time back. So with a tooth pick and my solder glue I created some tear shaped "balls" on the wires. The result is clearly a better spark. Whether it is enough better to work in the real world, only time will tell. 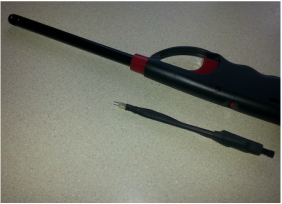 2016-03-30 I decided that I'd test my new igniter in a "real world" situation. So I took my Stanley with about a cup and a half of water, my Alcos stove, pot stand and windscreen and went out on the front porch. The temperature was 50 and a gusty breeze was blowing. With great excitement I opened the Alcos, stuck my snazzy igniter in and clicked. Nothing. I clicked again. Nothing. I decided the breeze must be blowing away most of the Alcohol gas/fumes so I clumsily covered it with the snuffer/simmer ring, waited a few seconds and tried again. Still NOTHING! I then verified that I was getting a spark - which I was. Finally, heartbroken, I struck a match and bingo, the flame took off. The moral to this story? Back to the drawing board! In the dead calm of the house it lights every time but outside in a breeze, no deal. I plan to play with the spark gap to see if I can get a more vicious spark. Admittedly it is currently faint. 2016-03-29 When I went to set my pile of leaves on fire a couple days ago the butane lighter I was using pretty much died. So I tossed it aside and got another. Today, something made me think about that lighter, particularly the igniter. It is one of those piezioelectric thingys that shoots a small spark when you squeeze the trigger. Completed igniter beside a lighter similar to the one I removed it from. With that in mind, I recovered the old lighter and carefully took it apart to see whether that ingniter could be re-purposed. The photo at left shows the result next to a similar lighter. Sorry I forgot to take any photos as I made it but perhaps with the photos and some comments I can explain how I did it. I beganI carefully pried the handle of the lighter apart after removing one small screw and a couple plastic things. Don't worry about breaking it as you're going to throw all but the little igniter away. Be careful not to pull the wires out of the igniter. Mine had two wires, one that that extended from the igniter to the tip of the lighter and the other extended just to the metal barrel of the lighter. The complete igniter with a section of an old Bic pen slid over it to protect the spark gap. The piezioelectric device in the shrink tubing. The business end of the igniter with the Bic pen body slid back exposing the spark gap. ​The ingiter came right out along with its wires, complete with a little push button originally pushed by the trigger of the lighter. I verified that it still worked by bending the wires carefully so the two ends were about 1/4 inch apart and then squeezing the little push button. I was rewarded with a very fine spark jumping the gap. My new igniter in action! Then I trimmed both wires the length of the short one and shrink wrapped them together with a wooden barbecue skewer alongside to keep them in place. I cut the skewer about 3/4 inche longer than needed. Then with a larger piece of shrink wrap tubing I attached the extra end to the side of the igniter body. That held the skewer in place, which in turn held the wires rigid. There was just enough of a shoulder on the igniter body to make it easy to squeeze the trigger. ​Then I I tested it on my Alcos stove and it works like a charm. One click and it burst into flame! 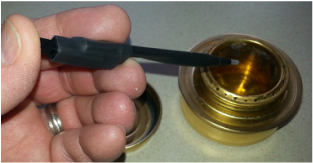 So that gives me a simple, water and wind proof igniter for my Alcos or other alcohol stove.